Missing or Lost Pieces | APPLE ONE Inc. Jigsaw Puzzles | Products information About APPLE ONE Inc.
Great effort is made to ensure that all pieces of the jigsaw puzzle are included, however if you believe that there is a puzzle piece missing, please check around the area of assembly, pockets, trash box, vacuum cleaner, etc. The missing pieces usually turns up in a few days any way. 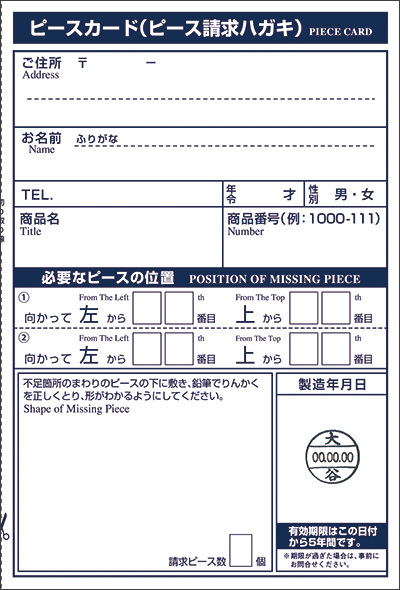 If you still cannot find the missing piece(s), please send us the ‘Piece Card’ included in the box. 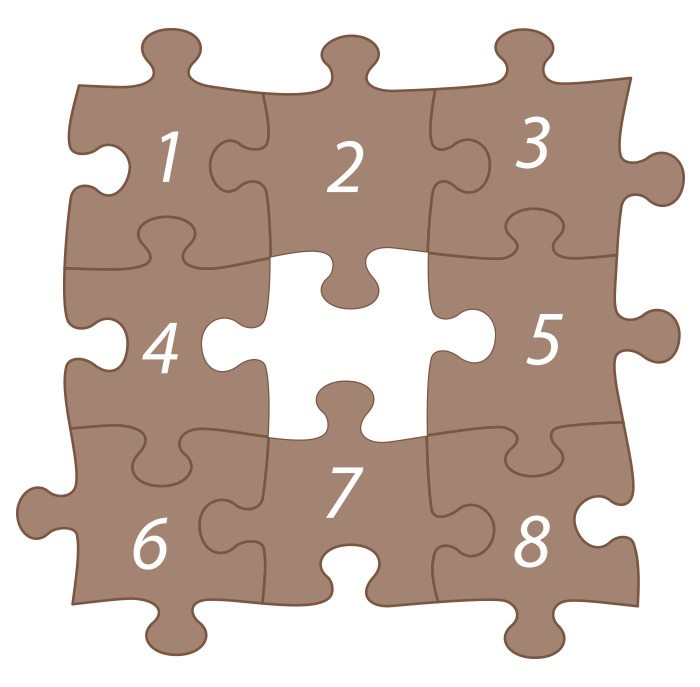 Each puzzle is cut uniquely and the ‘Piece Card’ is only suitable for the puzzle it is meant for. Piece cards and puzzles are not interchangeable. Please keep the ‘Piece Card’ until you have completed. *The lost piece service is good for at least a 5 year period after the production run ends basically. If you don't have the mail-in warranty form (‘Piece Card’), please send us a part of the puzzle sized 3x3 surrounding the missing piece. Please put the pieces together and lightly tape them on the wrong side, then mail it with the requested information (Your name, address, telephone number, purchased item number, item name and the location of the missing piece).